India must strike a balance between its new emerging partners and beneficial Western ties. The BRICS nations have rapidly evolved from a group of emerging economies into political contenders in a new world, driven by the search for an alternative to Western hegemony. Recent Western failures have also helped to launch the BRICS concept as an alternative, and has possibly pushed the countries closer together than they may have initially intended. There are also differences (the China-India border disputes for example) that would have seriously tested the relationship between other countries, but for now they are responsible for the multi-polar world that appears to be emerging. The Western approach toward BRICS has generally been one of skepticism, but when it comes to India there is a conspicuously different portrayal in the media compared to the rest of the countries. Although the recent U.S.-Africa summit suggests friendly relations, South Africa has always seen itself as a member of the global South and champions countries that don’t acquiesce to U.S. dominance. The conflict between the U.S. (somewhat supported by much of Europe) and Russia is well-known, and the media consistently highlights the conflict and difference between the U.S. and China. American interference in Latin America has made relations between Brazil and the U.S. touchy, and the rhetoric from Brazil in the wake of NSA spying last year was scathing. Despite relations taking a hit last year when Indian diplomat Devyani Khobragade was arrested in New York, U.S. and Western media have generally been friendly toward India, exemplified by President Barack Obama’s invitation to newly elected Prime Minister Narendra Modi to visit the U.S., despite Modi previously being blocked from the U.S. over his failure to stop sectarian violence as Gujarat’s chief minister in 2002, when more than 1,000 people were killed. It is likely that the U.S. views India as a potential foothold in Asia. India is often heralded in the Western media as the world’s largest democracy, in an attempt to provide common ground and a nod of disapproval to the likes of China and Russia. In contrast to the other BRICS members, Indian elites aspire to the wealth and influence of the U.S., and it is only natural that this aspiration would manifest itself in the politics of the country. Modi is a proponent of free market capitalism and this bodes well for relations with the U.S., which will see him as an accessible figure. There are further important differences between India and the rest of the BRICS nations. World Bank data shows that India’s GDP per capita severely lags behind the rest at around $1,500, four times less than China and South Africa, seven times less than Brazil and almost 10 times less than Russia. India hasn’t replicated the rapid growth of the other BRICS countries since the turn of the millennium, and this is also reflected in a slower reduction in the poverty gap. Just under 25 percent of the population still live on less than $2 a day, compared to 10 percent or less for the other countries. Such a severe development problem will hinder Indian growth in the near future and will see it fall further behind. Modi will be expected to implement reforms that improve growth and lift hundreds of millions out of crippling poverty. Growth alone will not solve the poverty problem in India however. When it comes to literacy rates in adults, the 2011 Indian census recorded a figure of 74 percent while the rest of the BRICS nations record over 90 percent. Literacy among women is even lower at 64 percent. Infrastructure in India is also sub-standard. An overburdened transport systems and insufficient electricity grids that are overly reliant on coal contribute to the poverty problem while hindering growth. Rapid urbanization is also putting pressure on these systems, making the problem more acute. India also has a digital problem as only 15 percent of the population uses the internet, compared to upwards of 40 percent for the other BRICS. Connectivity is important, particularly for those often marginalized in society, as evidence points towards benefits for education and health. India has a distinctive set of problems that the other BRICS countries have largely moved beyond. Given the political and economic clout of the BRICS collective, India could soon find itself left behind within the group. Indeed the statistics above and the obvious clout of China and Russia suggest that India may lack influence within the group already, despite efforts to spread power within the recently announced New Development Bank. This is where the U.S. could become more influential with India. In a recent interview with The Diplomat, Sadanand Dhume, a resident fellow at the American Enterprise Institute (AEI) and Wall Street Journal columnist, said that India would be foolish to join an anti-Western bloc as India’s rise is inherently tied to the West. Given the popular view that the BRICS are opposed to the West, India finds itself in the unique position of being a part of the BRICS collective as well as having overtly friendly relations with the U.S., a relationship that is likely to further improve in the future as Modi visits the U.S. and ties strengthen. India will need to manage its relationships carefully, as it will not want to find itself isolated from either the U.S. or the BRICS. It is also important that India doesn’t become geopolitically caught between the two sides: Any point of tension between the West and an individual BRICS country could reflect on the rest of the group. Indeed if India wants to achieve strong growth and solve its development crisis, then it will need to harness relationships with both sides. The next few years will be crucial for Indian development, and as the international political situation slowly evolves, it will be interesting to see how India locates itself in relation to the West and the other BRICS countries. 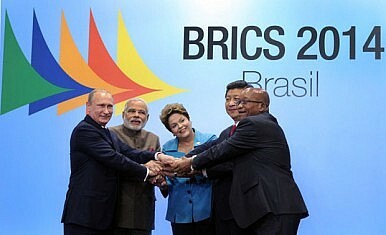 Stephen Junor writes on the rise of BRICS and geopolitics.